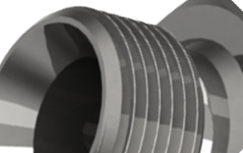 BURNETT & HILLMAN HAVE BEEN MANUFACTURING HIGH QUALITY, COMPETITIVE HYDRAULIC FITTINGS AND ADAPTERS IN THE UK SINCE 1965. 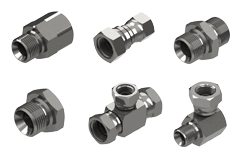 Our extensive range of adaptors includes stock in excess of 3000 different variations of JIC, SAE, Metric, BSP, BSPT, NPTF and NPSM made from mild steel (BS EN 10277:3:1999 – 230MO7 Pb). We specialise in not just one type of product – we have the flexibility to produce special requirements alongside our standard product ranges. This diversity of ranges and sizes, combined with our unparalleled customer service and technical assistance, gives Burnett & Hillman a distinct advantage over other suppliers. 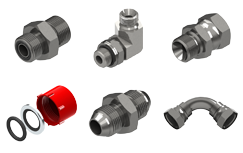 The market for hydraulic adaptors is a truly diverse one. Hydraulics are used in almost every facet of industry; Agriculture, Transport, Waste, Defence, Manufacturing, Marine, Construction, Mining, Engineering, etc. Hydraulic power plays a crucial global role in keeping these and other industries going. There are 3 main user groups – Original Equipment Manufacturers (OEM), Large Consumers and “End User.” We supply these markets both directly and through static distributors, operating from trade warehouses and providing products “over the counter” to their customers and, more recently, through mobile on site hydraulic repair and replacement services.